Dividend yield ratio shows what percentage of the market price of a share a company annually pays to its stockholders in the form of dividends. It is calculated by dividing the annual dividend per share by market value per share. The ratio is generally expressed in percentage form and is sometimes called dividend yield percentage. Since dividend yield ratio is used to measure the relationship between the annual amount of dividend per share and the current market price of a share, it is mostly used by investors looking for dividend income on continuous basis. The dividend yield ratio is 8.5%. It means an investor would earn 8.5% on his investment in the form of dividends if he buys the company’s common stock at current market price. Both the companies belong to same industry. PQR is an old and well established company whereas XYZ is a new company. 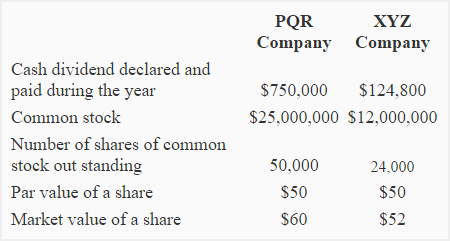 The historical data shows that the PQR has a stable annual dividend distribution to stockholders. Required: Calculate dividend yield ratio of both the companies. Which company would you recommend for investment in shares? Explain with reasons. An investor should prefer the PQR company because its dividend yield ratio is significantly higher than that of XYZ company. PQR is an old and well established company with a stable dividend distribution history. Also there are good chances of appreciation in the market value of the stock of PQR. Because of these reasons, PQR is a more reliable and less risky company for investment portfolio as compared to XYZ. The ratio is important for those investors who purchase shares to earn dividend income. Also the shares that earn higher dividend income can be sold in the market at higher prices that usually results in higher profits for the investor. Depending solely on dividend yield figure for making investment in a company may not be a wise decision. A high dividend yield percentage may be due to a recent decrease in the market price of stock of the company due to sever financial troubles. It may have to reduce the amount of dividends in future that may further reduce the market value of its stock. Therefore, a company with attractive dividend yield figure may not always be the best option. Dividend yield ratio is only one of the several indicators that experienced investors take into account while purchasing the shares of a company. Before making a final decision, one must have a hard look at the historical dividend data, industry’s average dividend yield, the overall financial strength of the company and all other available investment opportunities. The explanations are kept simple and good. Thanx. Example is not 8% yield @$1.70 per share. It is 8.5%. Very useful since be much aware to invest on stable org. when there expected rate of return, the org. is much reliable and less risky.